Inflammation of a joint is referred to as arthritis. The inflammation arises when the smooth covering ( articular cartilage) at the end surfaces of the bones wears away - osteoarthritis. In other cases, the inflammation is caused when the lining of the joint becomes inflamed as part of an underlying systemic disease. These conditions are referred to as inflammatory arthritis. The typical symptom of arthritis is joint pain. Inflammatory hip arthritis is mainly characterized by an aching pain in the groin region, outer thighs or buttocks. The pain is commonly most severe in the morning and sometimes lessens with activity during the course of the day. Vigorous activities may result in increased pain and stiffness. Night pain and rest pain develop as the arthritis worsens. Inflammatory hip arthritis results in a stiff and painful hip. X-rays and laboratory tests are ordered to diagnose or rule out other conditions. X-rays may show thinning or erosion in the bones or a reduction in the joint space. Laboratory studies will often show the presence of a rheumatoid factor or other antibodies. Non-surgical treatment: Any inflammation in the hip joint is firstly treated by non-surgical treatments which may provide relief with relatively few side effects. Physical therapy may be recommended to help you increase the range of motion and strengthening exercises are encouraged to maintain muscle tone. Surgical treatment: Surgery is considered the last treatment option when the above non-surgical treatment options fail to control the symptoms. 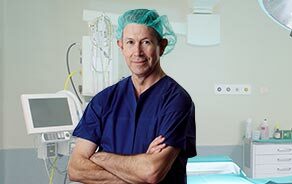 The type of surgery to be performed depends on your age, condition of the hip joint, and the type and progression of the inflammatory disease. The goal of the surgery is to relieve pain and to improve function. 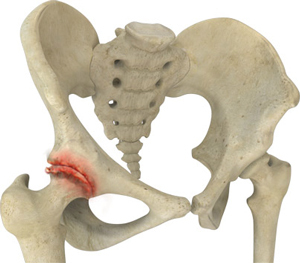 The most common surgical procedure isTotal hip replacement.